Sushiyama is located on the corner of Brunswick St. and Broadway right across from Kingsgate mall and also across from Pho Thai Son. Everyday is a good day for sushi so I was excited to try them out. I actually did not really end up getting sushi since I had the Katsu Don. It was a great deal for $6.25 and it comes with miso soup too. 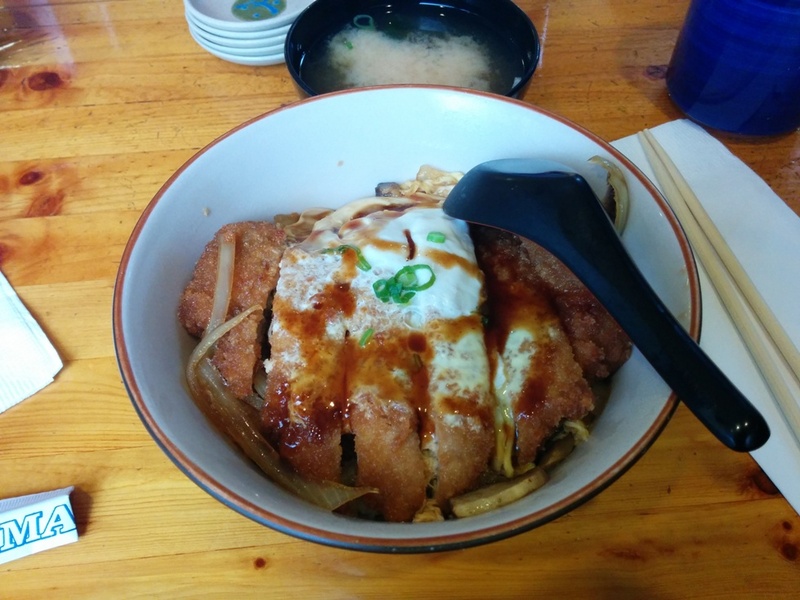 The pork cutlet was nicely battered, not dry and fried with an egg on top. There were also some mushrooms and onions underneath too. The rice had the right amount of sauce unlike the really dry rice I had at Zipang Provisions. Also the pork at Zipang wasn’t cut up either so it was more difficult to eat. I definitely liked this version better! There isn’t that much rice though so if you eat a lot this probably won’t fill you up. 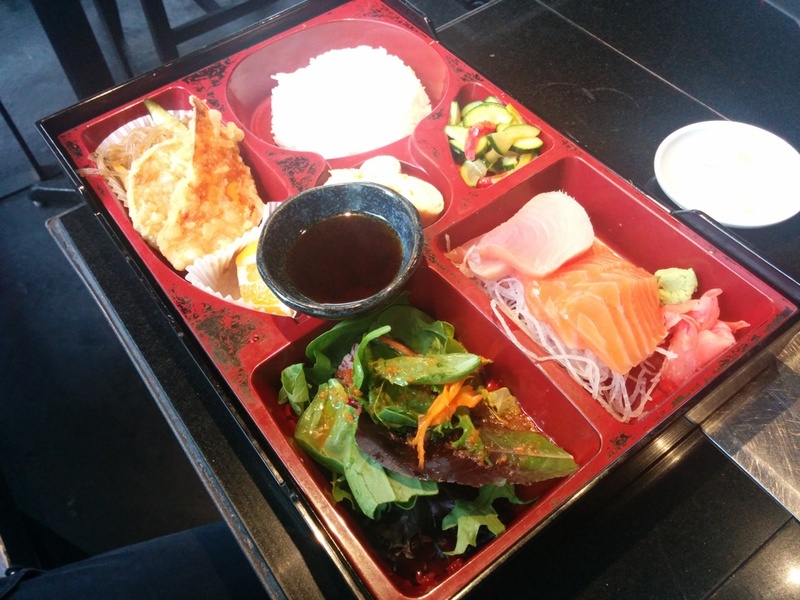 This entry was posted in Food Reviews, Japanese and tagged bento box, donburis, sashimi, sushi, tempura, toro, unagi. Sushi Mura opened in my neighbourhood and I’ve been there a few times already so that’s a pretty good sign. It seems like they’re open by the same people as Sushi Garden and the inside looks very similar too. Pricing is also really cheap! They always have long lines so be prepared to wait. 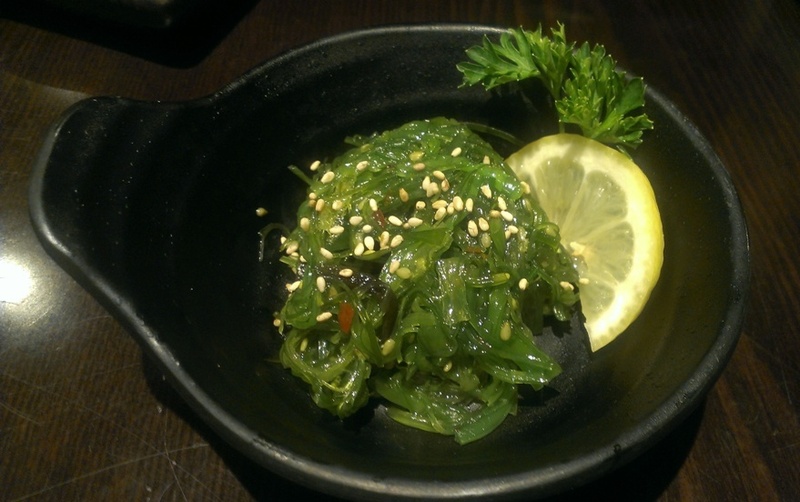 Seaweed salad. Pretty standard and one of my fave salads so I enjoyed it. 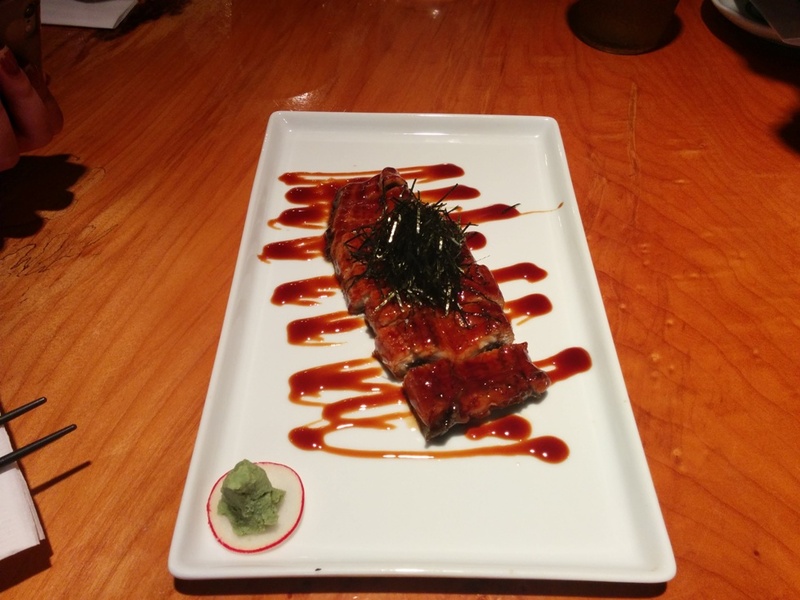 This entry was posted in Food Reviews, Japanese and tagged cheap eats, sashimi, sushi, tempura. Manna Sushi opened on W2nd and Ontario a few months ago but I never got around to blogging about it. It is pretty much the only sushi place around besides Aqua Sushi and Juice Bar which focuses on healthy food and makes their sushi with brown rice. The inside of the restaurant was pretty spacious. This entry was posted in Food Reviews, Japanese and tagged oysters, sashimi, sushi, Volcano roll. Sushi Mania is a newer sushi joint on Main and 21st Ave. The place is pretty small and it felt a bit sparsely furnished but still comfortable. We started with a Tuna and Avocado Salad. Nothing extraordinary but it was tasty and gets the job done. 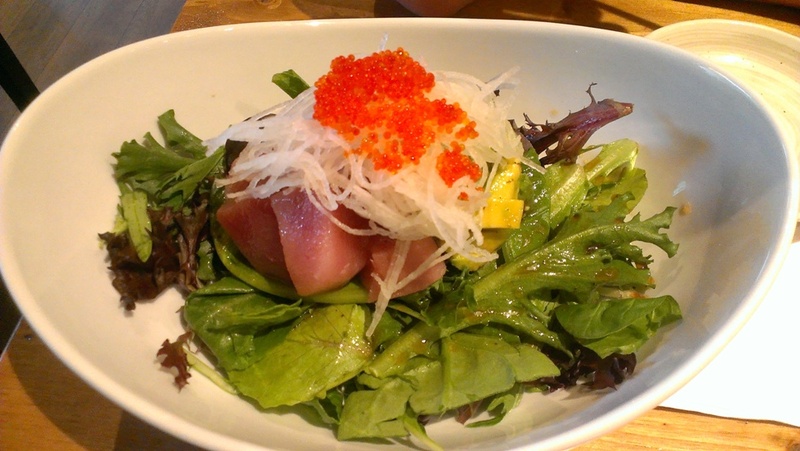 This entry was posted in Food Reviews, Japanese and tagged sashimi, specialty rolls, sushi. Sushi California is located on Broadway and Yukon next to Chronic Tacos and it never seemed particularly enticing to me but I had to try it someday. It’s a medium sized restaurant and it’s bright and inviting inside. All the servers were also really young. We started with some Tuna and Salmon sashimi. The slices were HUGE. It was almost on the brink of being difficult to eat. However it was a really good deal and fresh! It was about $8.95 for 9 slices which is pretty good since they were so big. We also tried their Seafood Noodle Salad which came with dressing on the side. 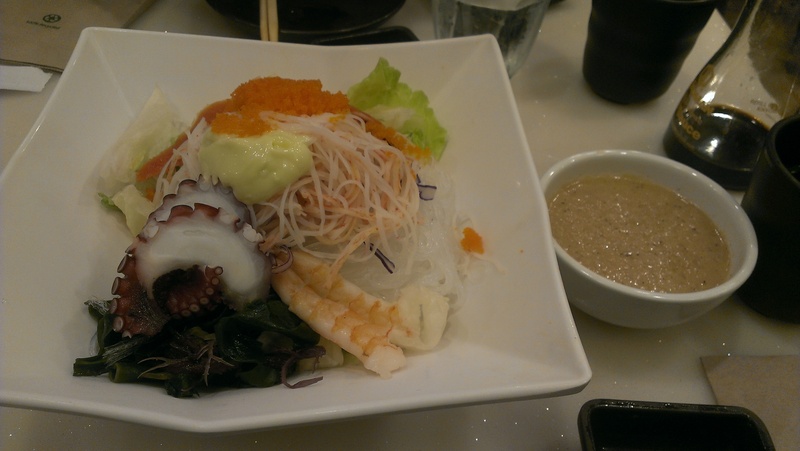 It had vermicelli noodles on the bottom, lettuce, seaweed, and a few pieces of seafood (octopus, shrimp, smoked salmon). This was also quite filling since there were a lot of noodles and after you mixed everything up it was quite tasty! There was also a hint of wasabi from the wasabi mayo. They also give you a lot of dressing and we didn’t have to use all of it. They could’ve had more seafood though! I was expecting more like a sashimi salad. We also ordered some rolls to share. The one on the tops is the Yellow Town roll. This was a California roll with something like coleslaw on top. I wouldn’t order this again because the flavour of the raw onions was just too strong. Sorry I don’t remember what else was in it! It just tasted like a salad mixture. I do like onions too but after eating 2 pieces it was a turn off. The other roll is the Smoked Salmon Cream Cheese II roll with tamago and something else? It was alright. There is also a Smoked Salmon Cream Cheese I roll which is more basic and cheaper. 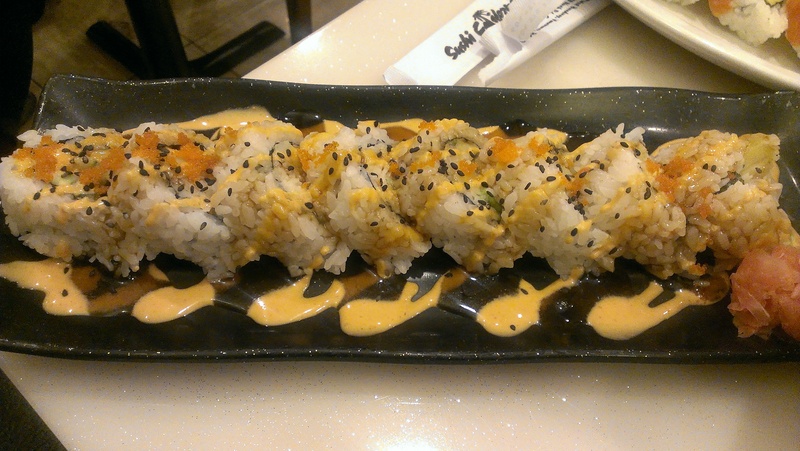 This was the Las Vegas roll which was also my favourite! It had avocado and yam and a lot of sauce. My only problem with their rolls is that they were loosely made and fell apart easily and this is not due to my lack of chopstick skills! Otherwise they were all large enough and you get your bang for your buck. They also have a lot of fusion rolls for $3.95-4.50! So I had a pretty good experience here and I would definitely return again! They also seem pretty popular and it’s super close to the Broadway skytrain station. We went at around 9pm so maybe the service was better then? According to the reviews there seem to be a lot of complaints. 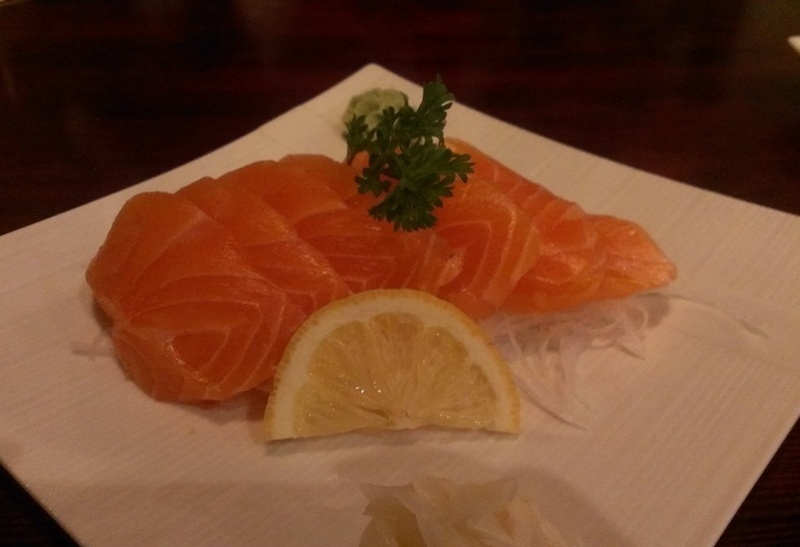 This entry was posted in Food Reviews, Japanese and tagged cheap rolls, sashimi, sushi. While my friend and I were shopping at Metrotown, we decided to check out Sushi Garden across the street for lunch. We arrived at 1:30pm and hurray no line ups! In fact we were promptly seated as well. 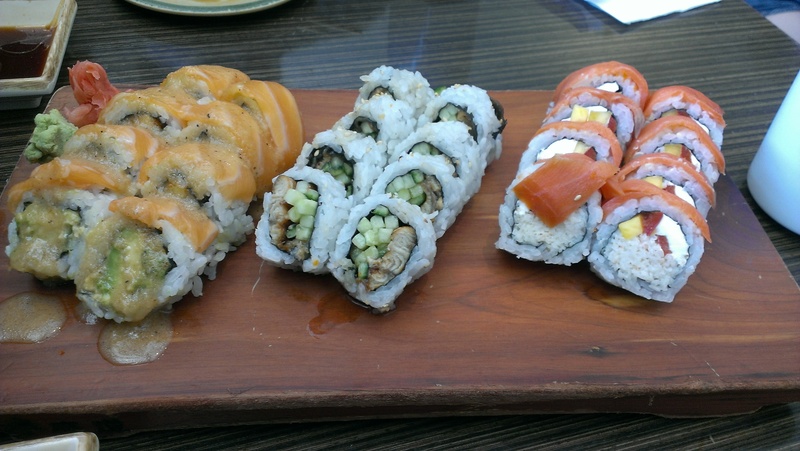 Every roll on the menu was around $4 so we decided to get three: Alaska Roll, Unagi Roll and Salmon and Cream Cheese Roll. My favourite roll here was the Alaska roll due to the sauce they used that gave it a slightly acidic taste. Presentation wise it could use some work like fixing the piece of smoked salmon falling off but it was a fair deal for ~$4! 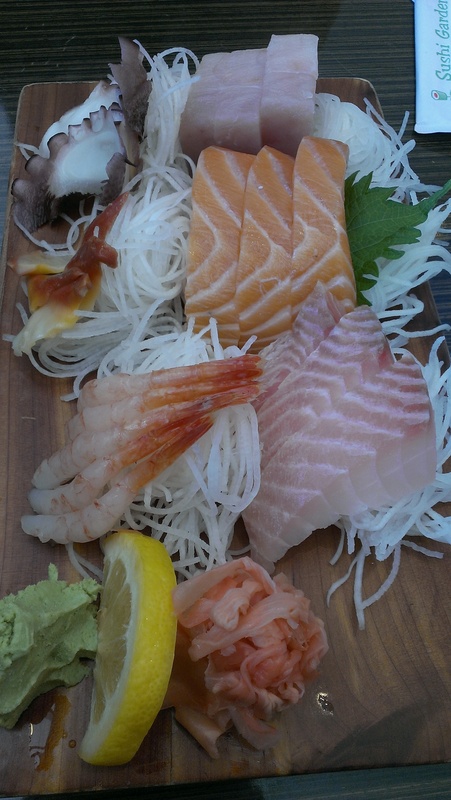 We also decided to order Assorted Sashimi too. It was about $14 for 18 pieces. Ok this deal was almost too good to be true but it turns out they gave us 5 super small pieces of shrimp. I wasn’t too upset though since it was so cheap. I’m not familiar with getting shrimp so is it suppose to be that small? Fish was fresh though! We probably had the fastest sushi lunch of our lives since we were only there for about 25 mins and it wasn’t busy. 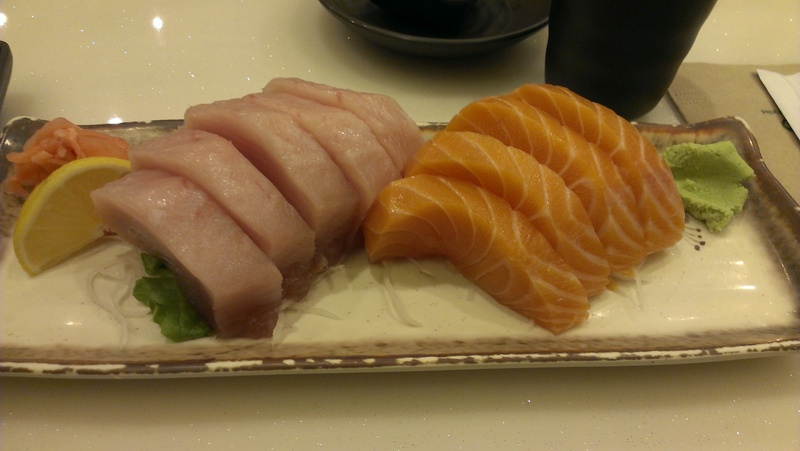 I still prefer going to Sushi Oyama down the street though but at Sushi Garden you get your bang for your buck. 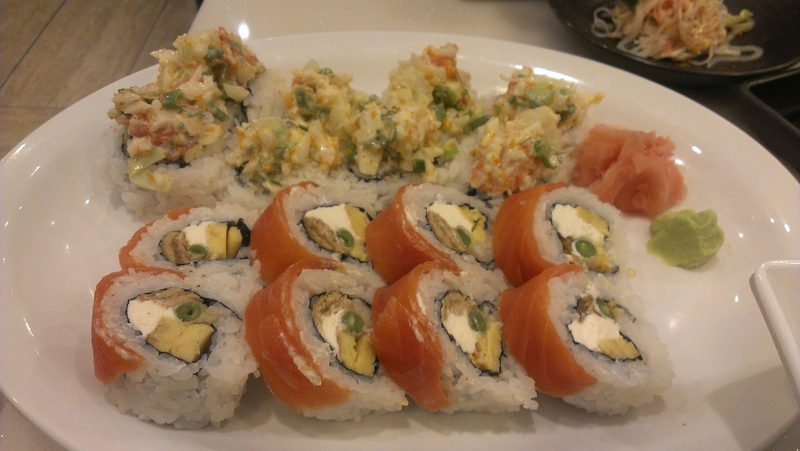 This entry was posted in Food Reviews, Japanese and tagged cheap eats, sashimi, Sushi Garden.